R-Tech Dental of MN will be closed for a week during the month of July. 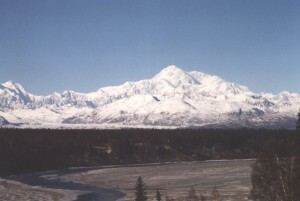 I’m taking my wife to Alaska to make up for all of the years without a real vacation and to give her the honeymoon in Alaska that she never got. We will be gone from July 16th (Sunday) until July 25th (Tuesday). 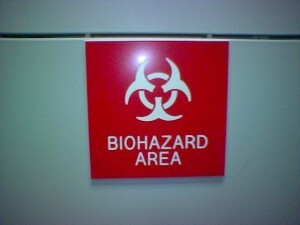 If during this time an emergency should occur… Eeeek! If it is not an emergency, please leave a message for me or call me back on Wednesday and we will get you scheduled up for a service call. Join us in Welcoming Dr. Melissa McCulloch to our staff! She is a 2002 graduate of Marquette University School of Dentistry in Milwaukee, WI. After dental school, she completed one-year General Practice Residency at the Veteran’s Affairs Medical Center in Minneapolis. Dr. Melissa practiced in St. Cloud for 2-1/2 years before relocating to Rochester. She is a member of various national, state and local dental organizations. Dr. Tony Lund has a dental office space available in Rochester, MN. 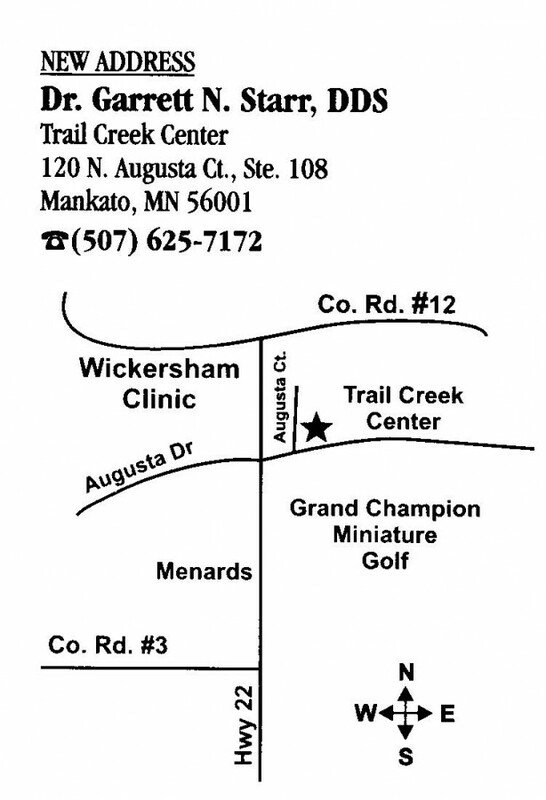 The space is located directly above the offices of Dr. Truax and Dr. Praska (orthodontists). It is across the street from Lourdes high school at 15 NW 7th Ave. The space includes 5 operatories complete with chairs, lights, delivery units, and X-ray units. There is a waiting room, private back office, records room, consult room, bathrooms, storage, and a sterilization/break room. Dr. Lund can be reached at (507) 319-3508 if you are interested in a tour of the space. We are making some changes to our newsletter that we hope will be exciting and make this area even more functional for our customers. You will notice now at the end of each of our newsletter articles is a comment and email buttton. The email button will allow you to forward the newsletter article to a colleague or anyone else that you think might have interest. The comment button will allow you to comment on any of our articles that you read. If you have a question about something that I write, or if you want to add a comment please do so! Maybe you have a suggestion of a better way to do something, or maybe you have some other conclusions. As with any blog, these comments will be visible to others. In the next few weeks, we will be more finely integrating the blog into the framework of the website to make it feel more comfortable. We will also be making all of the historical links active as well. Thanks, and I look forward to hearing from all of you. Dental Hygienist Kris Billman of Byron, MN opened the doors of Children’s Dental Health Services on Feb 1, 2006. She provides dental services for children from ages 1-5 without dental insurance. Her office is located within the United Way building and her office hours are 8AM – 5PM Monday through Friday. Billman is seeking any donations that can be provided. CDHS will run primarily through reimbursement from programs like Medicaid and MinnesotaCare. She plans to expand her services to cover children up to the age of 18 by March. Way to go Kris! 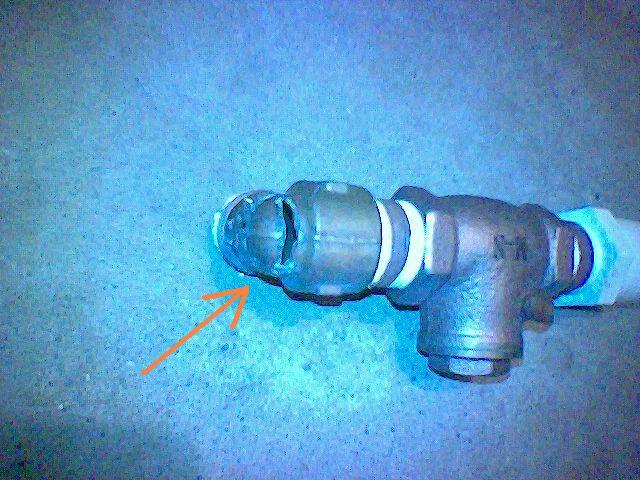 Heat can damage your compressor and vacuum systems. If you have a small utility room that has no ventilation it can get extremely hot in there. 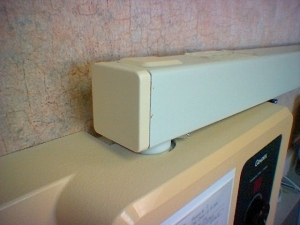 To avoid problems with the room getting too hot, you may want to consider adding some ventilation. This means either having a vent and a return installed in the room or having some kind of bathroom fan installed to vent the hot utility room to the outside. 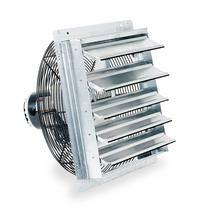 Now, nobody wants to vent their heat to the outside in the dead of winter or have a bathroom fan running 12 hours a day venting air conditioned air to the outside in the summer either. 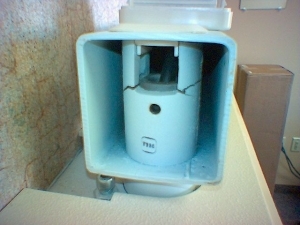 So here is the solution if you cannot get a vent and a return installed. Have an HVAC installer put in a bathroom fan that is controlled by a thermostat. That way, the bathroom fan only runs when the utility room gets too hot and does not when it is unnecessary. Our congratulations go out to Geetha J. Damodaran, D.D.S. and her staff. Please feel free to call these doctors/offices to inquire about their used X-Ray machines. Bleach and various other cleaning chemicals (including some acidic vacuum line enzymatic cleaners) are NOT your vacuum system’s friend. It amazes me how much damage can be done by the wrong types of cleaners. To give you just a little taste of what I’m talking about, here is a picture of a brass fitting on a wet-ring vacuum pump. 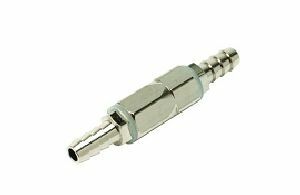 Keep in mind that this fitting is made of solid brass and has a nominal wall thickness of about 3/8″. As you can see from the picture, there is a gaping hole where solid metal used to be. The really tragic problem with this is that bad cleaners adversely affect the entire vacuum system, including any copper vacuum lines, pump fittings, pump impellers and housings, and even any amalgam separators that are inline. 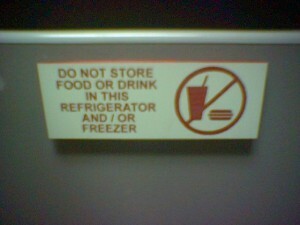 So once a problem like this is noticed, plenty of damage has had a chance to occur. Yesterday, I was working at Dental Health Affiliates, the office of Dr. Charlie Smith, in Rochester, MN. I noticed something that I have not seen in any other offices. They have taken the time to have plastic signs engraved with all of the various OSHA compliance labeling. In many offices this labeling has been accomplished using simple adhesive stickers that eventually peel and/or look worn after short periods of time. The engraved plastic signs that Dental Health Affiliates have posted look very professional, and have a permanency to them that regular stickers will never have. How far should clean water bottles be filled? 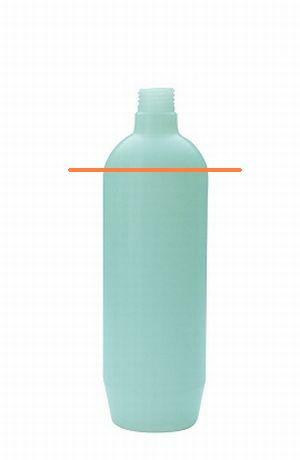 #1 As a bottle is screwed onto a clean water system manifold, the feed tube displaces water as it enters the bottle causing water to spill over causing a mess, especially if the solution in the bottle is a waterline cleaning agent. #2 If a bottle is completely full of water when screwed onto a clean water system manifold the water is at such a high level within the bottle that it comes into contact with the air inlet hole of the manifold. If the bottle gets pressurized and then de-pressurized, the water tends to get into the air line. This water can damage bottle on/off toggles, pressure regulators, as well as even cause water to come out when the air button is pressed on a syringe. This condition is referred to as air/water crossover and is something we want to avoid if at all possible. Ah, so here comes the answer to the question that everyone is asking right now. “How full should I fill the clean water bottle?” — We suggest that you stay down about 1.5 inches from the neck of the bottle. Some of the newer clean water bottles actually have a raised fill line molded onto the bottle. We basically want to make sure that there is a gap of air near the top of the bottle even after it is screwed onto the manifold. Today we finished moving Dr. Starr into his new office. Wow! What a nice upgrade for him, his staff, and his patients. We wish Dr. Starr and his staff well in their new location and want to thank him for the chance to be a part of this relocation. At R-Tech Dental, we would like to wish you and yours a very Merry Christmas and a Happy New Year. We also want to let all of you know that R-Tech Dental of MN will be closed the last week of December this year (December 24th – January 1st). R-Tech Dental of MN will re-open on Monday, January 2nd. Mike is taking time off to spend with his kids. I have seen many assistants improperly using a lead vest while trying to take a panoramic X-ray. The rotation of a panoramic tube head usually starts on one side of the patient, rotates around the back of the patient’s head, and ends on the opposite side of the patient’s head. Does placing a lead vest over the patient’s chest do anything to protect them from radiation during exposure? No. The radiation on a panoramic rotation comes from the sides and from behind the patient not the front. If you must use a full size lead vest for panoramic X-rays you are better off placing it over the patient’s back being careful to not allow it to be placed too high on the patient’s neck. If the lead vest is placed too high, you will very likely loose the anterior teeth and/or the lower half of your radiograph. We have a better solution — The panoramic cape. It is a lead vest that is specifically designed for use with a pan. 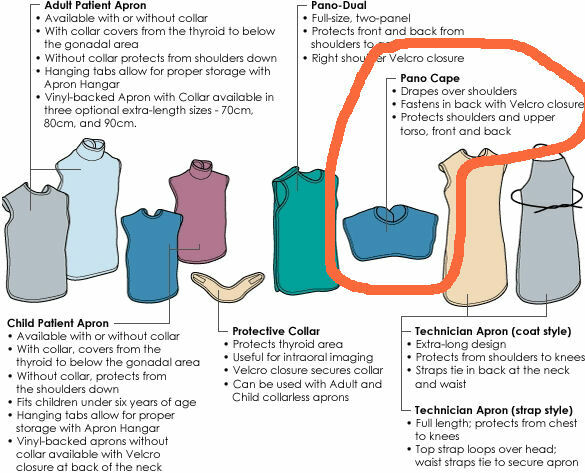 It covers the shoulder area and wraps the patient from front to back covering just the critical areas that are in harms way during a panoramic exposure. Click on the image below to be taken to the product information page. Why are screen contact tests required annually? Inspection of cassettes for good film screen contact is an often overlooked yet important quality control procedure. 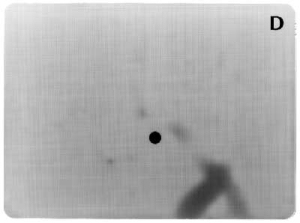 Poor film/screen contact can be the reason for areas of increased density, reduced density and blurring. 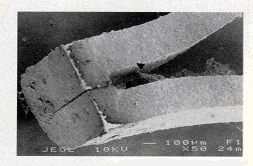 The film that you install into your cassette is not exposed solely by radiation. It is exposed by the screens within the cassette that glow when hit by radiation. 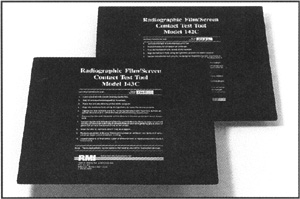 If these screens are dirty or are not in good contact with the film, they can yield poor radiographs that can possibly lead to a mis-diagnosis of a patient’s condition. Some states, like Minnesota, require screen contact testing on an annual basis. 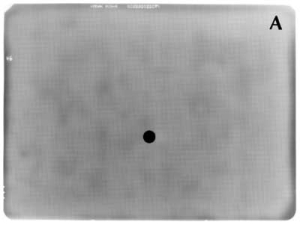 We perform this testing using a screen contact test tool which is a flat device that is about 14″ x 17″ consisting of a wire mesh encased in plastic. And here are some examples of tests that have failed for various reasons. Poor screen film contact can sometimes be corrected by cleaning the screens using an anti-static intensifying screen cleaner such as Kodak’s Anti-static Intensifying Screen Cleaner which comes in a pump spray bottle. You clean cassette screens by moistening a lint-free wipe with a small amount of screen cleaner, then rubbing the screens with the wipe. Always remember to allow the screens to dry completely before re-testing. Avoid any excessive rubbing, abrasive gauze, pouring of any solution directly onto the screens, or using an excessive amount of solution. If cleaning does not work, screen replacement would be the next step. If that does not work due to worn out cassette seals or flattened foam backings then the cassette itself will need to be replaced. Judging by how the screen test fails and how the cassette seals/foam backing look, we are normally able to recommend the course of action that will get your cassette to pass again. 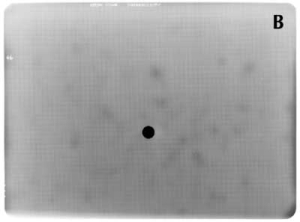 Can Peri-Pro chemistry be used in a full size AT-2000 film processor? This question was posed by a doctor that had a bunch of Peri-Pro chemistry in the basement that he wanted to use up. He was hoping to avoid having to buy cases of full-size processor chemistry. The first point I want to make here is this: Our recommendations have and always will be to use chemistry that is specific to the type of processor that you have. Manufacturers will adjust the quantities of component ingredients in their Chemistry formulation to match the performance and price parameters they have established for their product. Formulations also change based on the time and temperature that the chemical is designed to work under. If you have a Gendex GXP processor, you should use GXP chemicals. If you have an Air Techniques Peri-Pro then use Peri-Pro chemistry. The use of generic or non-unit specific chemistry can cause damage or discoloration in the long term, not to mention providing you with image quality that is less than optimal. Peri-Pro processors are designed to operate at room temperature (ideally 72-74 degrees F). 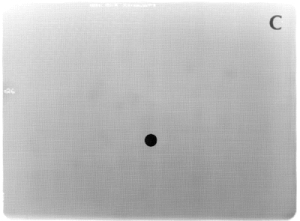 Peri-Pro IIs and Peri-Pro IIIs still only heat the chemistry to 72 degrees F. Full size Air Techniques processors operate at 82 degrees F. This temperature difference would, I believe, lead to darker X-ray images if Peri-Pro chemistry were heated in the full size processor. 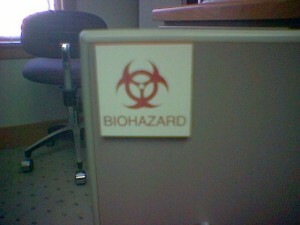 Thus, I suggested to the doctor that he not use it as a temporary replacement. Today I was at Professional Drive Dental doing routine service work, when one of the hygienists mentioned to me that she was having trouble with her X-ray arm drifting. Upon inspection of the X-ray, we found that the swing arm had cracked. 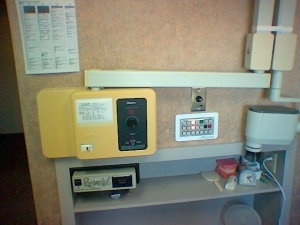 After inspection of the unit, the doctors and I both agreed that the arm needed to be secured and the machine disabled until a replacement arm could be ordered and installed. Nobody ever wants the liability of a heavy tubehead crashing down on a patient’s face. 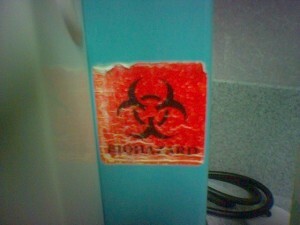 We also decided it would be prudent to investigate the remaining X-ray units in the office. Low and behold there was a second arm that was also cracked but not nearly as bad as the first. We went ahead and ordered and installed an arm for that unit as well. Not knowing if this was a fluke or something of a problem that everyone could possibly have, the doctors suggested that I recommend that other offices have their X-ray arms checked. 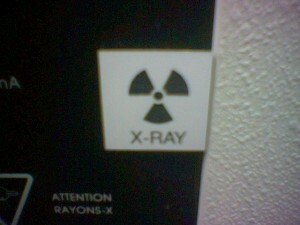 So, if you have us in your office on a normal service call, we will happily inspect your X-ray arms for any problems. The biggest point that I have in all of this is that I want staff to be observant of the equipment and how it is supposed to function so that they can let me know when something just isn’t right. This was a good catch by the Professional Drive dental staff! We noticed that the horizontal arm was not horizontal. You remove this plastic cover to look inside. The crack on this arm was quite evident. How do I properly use a water tester and why do we have to test the water anyhow? Take gallon of water and shake it to make sure that any disolved solids that have settled on the bottom of the jug are now floating. Remove the black cover from the bottom of the water tester and insert the tester into the neck of the bottle submerging the base of it approximately 1 inch into the water. It may be necessary to squeeze the jug of water to get the water level to rise enough to reach the tester. Press and hold the “ON” button. 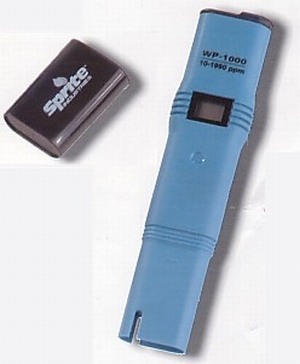 Preferrably for at least 30 seconds to allow the water tester to adjust to water temperature. The unit uses a thermometer in combination with electrical conductivity to determine the ppm TDS. If the reading is 003, 002, 001, or 000 then the water is acceptable for use in the statim. If not use if for some other application within the office. Dry off the end of the water tester and re-cover for use next time.